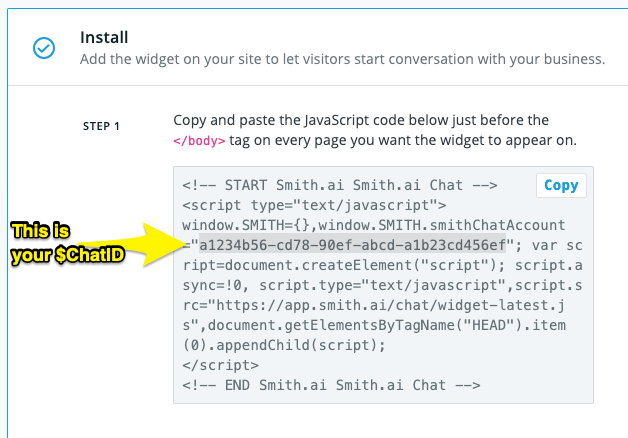 You've installed the Smith.ai Chat widget on your website, but you don't want it to appear on specific pages. For example, certain areas of your website may drive an abnormal amount of bad leads (e.g., high SEO pages for people just seeking information), wasting your time. Find your Chat ID and keep this handy. We will refer to this as $ChatID. Replace $ChatID with your actual Chat ID. Ok, assuming you did everything, You'll now have a chunk of code like this. BUT NOT THIS, because if you just copy and paste ours, it won't do anything.